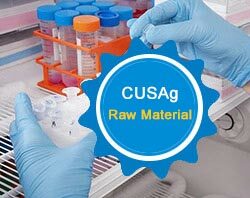 CUSAg acts as an independent brand of CUSABIO, focusing on raw materials for in vitro diagnostics, with outstanding team on research, production, sale, and striving to become the world's most professional Supplier of raw materials for IVD. CUSAg products high quality and specifications depend on its advanced research and development team, internationally advanced production equipment, strict and efficient process, international standard quality control, precision testing instruments on finished product. CUSAg products mainly include monoclonal antibody and polyclonal antibody for IVD, enzyme, protein, etc., comprehensively covering all types of cardiovascular disease, reproductive system disease, malignant tumor, all kinds of infectious diseases, drug abuse, and other fields. Adhering to the tenet-technology as core, quality as life, customer as god, CUSAg products have been tested through a variety of application platform and a large number of clinical samples validation repeatedly, meeting the development of diagnostic kit on ELISA, chemiluminescence, immune turbidimetric, POCT, etc. CUSABIO is a leading biotechnology company focusing on raw materials for IVD, reagents for research, food safety products, and biotechnology services. CUSABIO mainly provides related products and customized services to customers from well-known biotechnology and pharmaceutical companies, academic, enterprises and research institutions, as well as diagnostic reagent manufacturers. CUSAg Purpose: Professional products and sincere service, to provide you with a full range of support.